Antoine Griezmann’s opportunistically taken goal ensured that Atletico Madrid progressed to the final at Bayern Munich’s expense, but only after a thrilling game. In a fascinating clash of styles the Bavarians finally played to their full potential, showcasing their ability after 3 years under Pep Guardiola. They were nearly unstoppable at times during the first half; with great movement, dribbling, passing and unpredictability managing to stifle even Atletico’s disciplined defense, although the Spaniards were not at their best defensively. Most importantly, the German giants were impeccable in their transition from offense to defense, limiting Antoine Griezmann to 6 touches. Prior to the game, my prediction was that Bayern would probably score 2 goals. Anything less than 2 seemed unlikely at the Allianz Arena, while putting 3 or more past this Atletico side is a tough ask. But the real question was whether they would be to keep Griezmann or Torres out, which seemed unlikely in the circumstances. Considering Bayern’s adoption of an extremely high line, a 1 on 1 chance was always likely to present itself. But Champions League semifinals have never really been predictable in the past, and even the staunchest of supporters would have struggled to envision Bayern take the game to the visitors in such an emphatic manner. Forget the 90 minutes, Bayern nearly put 2 past Atletico within the first half an hour. This rapid chance creation was largely down to Bayern’s multi-faceted attack, and ability to recover the ball once Atletico cleared. Whereas in the first leg Guardiola looked to play the ball out wide and avoid losing the ball in central areas, he was relatively fearless this time around. There’s no doubt that Pep has assembled a well-rounded team of players, physically and technically. Bayern has speed down the flanks, a well-rounded striker and a space interpreter to go with him, a box to box midfielder, a deep-lying playmaker, physically adept center backs and 2 of the best full backs in world football. Even Barcelona arguably lack the physicality of this side, and aren’t far ahead technically (apart from the front 3). The result was that the opening period saw Bayern showcase their array of tricks. Unlike the one-dimensional crossing which was visible in the first leg, this side was a varied show. Thomas Muller ran in behind, Jerome Boateng sprayed long balls forward, Costa and Ribery drifted inside, and Atletico were overwhelmed. It’s also worth nothing that the home side were far faster in their passing compared tolast week as well. There was little probing, and in fact, this wasn’t exactly possession football. 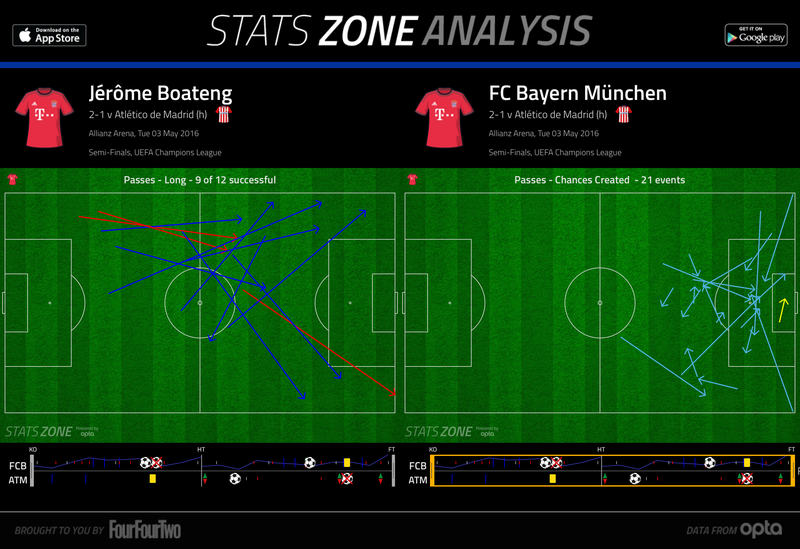 There was little patience in Bayern’s approach, they often found direct routes to Bayern’s goal. A strong possession game on the ball, as Guardiola has proven, is much more deadly when complemented with great attack to defense transitions. Indeed, Guardiola is a great defensive organizer like Simeone and Mourinho, but he organizes his teams to immediately recover the ball, rather than prevent goal scoring opportunities. 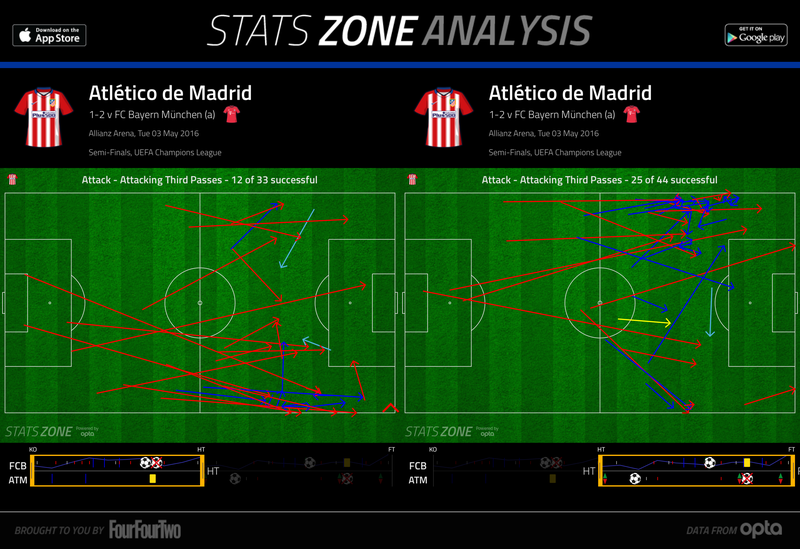 Atletico often play quick, short passes out of defense before carrying the ball forward. 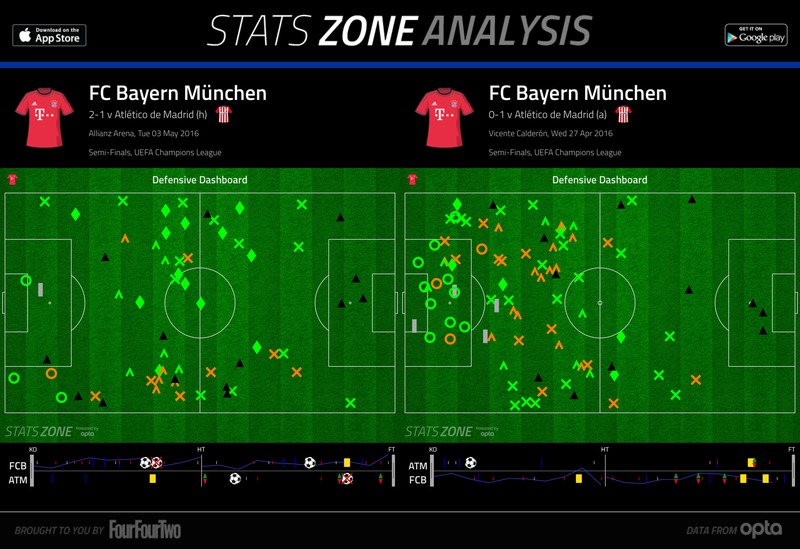 But Bayern were excellent when it came to ball recovery. Whenever Atletico cleared the ball, at least 3 of Muller, Lewandowski, Vidal and the winger would press to recover, while the full back would often join in. Barcelona have tried this as well, preventing Atletico’s clearances and transitions can force them into fouls. But even when they cleared, Bayern had a great plan. With Martinez and Boateng both playing, one of them often played as a destroyer whenever Atletico launched the ball towards their strikers, while the other sat slightly deeper as a sweeper. This proved to be extremely effective. Both Torres and Griezmann were easily stifled during the first half, and continously lost the ball in wide areas. Atletico themselves weren’t great off the ball. Jose Maria Gimenez struggled in particular, but their frustration, along with the crowd and balance of play nearly ended the tie in a frantic first half. Something had to change at half time, but Simeone, rather than looking to reinforce his struggling midfield, brought on fleet-footed winger Yannick Ferrera Carrasco for defensive midfielder Augustō Fernandez. A bold move in Munich. But it worked out perfectly. Carrasco made runs from extremely wide positions, carrying an offensive threat. His presence was important for 2 reasons. Firstly, he offered an outlet to Torres and Griezmann. Multiple times during the second half, Griezmann or Torres would run into multiple defenders, only to switch play to Carrasco and sustain the attack. In a game of small margins, this was useful. Next, not only did Bayern have more to worry about, but they couldn’t be as compact defensively. Prior to half time, Alonso, the full backs and center backs would stay in central positions. Carrasco, however, forced them to change their positioning and stay wide. Bayern still dominated the half- but Atletico had more time to regroup, and also scored and won a penalty in the second half. Simeone is often lauded for his defensive organization, which is nothing short of brilliant. Nevertheless, in this match, it was his ingenious offensive substitution which got his side through. Carrasco influenced his side’s attacking play. It was inevitable, or so I thought. Against a well-drilled side like Atletico, playing such a high line with emphasis on aggressive interceptions would eventually lead to the concession of a few chances. And once Griezmann scored, even after Lewandowski’s goal, Atletico were far better at shutting down Bayern’s attacks. The goal illustrated the limitations of Guardiola’s playing style; against quality players it’s impossible to have a defensive plan centered around keeping the ball ‘away from them.’ It worked at Barcelona, but even then Guardiola only truly dominated one semifinal (2011) and that was after Pepe’s red card in the first leg. Otherwise, he has lost 5 and won 1 Champions League semifinal, which was on away goals. It was a brilliantly fought tie, among the closest in recent memory. Both sides implemented their radically different game plans, but Atletico’s ability to press Bayern early on at the Calderon ultimately shifted the tie in their favor. There was little between the sides come the final whistle in Munich, however. While Guardiola has showcased the benefits of possession football at Barcelona, he has also exposed its limitations in Bayern Munich. He successfully stretched Atletico over 2 legs, but the idealistic nature of his style has been exposed not once but 3 times in the Champions League semifinals. Champions League winners often sport solid defenses. Guardiola’s teams do as well, but against Messi, Ronaldo and Griezmann, the margin for error is too small. But calling him a failure for the same reason is harsh- he has rebuilt a UCL winning team, and has prevented them from collapsing due to complacency. But recent developments beg for the question: With Bayern being the only team to play offensively in the semifinal, is it the end of an era? It will be interesting to see if Simeone has stalled the radical revolution of possession football in Europe over the last 3 years. As for Atletico, this surely is their year. They’ve outplayed Barcelona, edged Bayern Munich and are the strongest side in Europe. Fitter, younger and more versatile than their 2013-14 counterparts, they should see off a Real Madrid side which has largely regressed since the end of 2014.